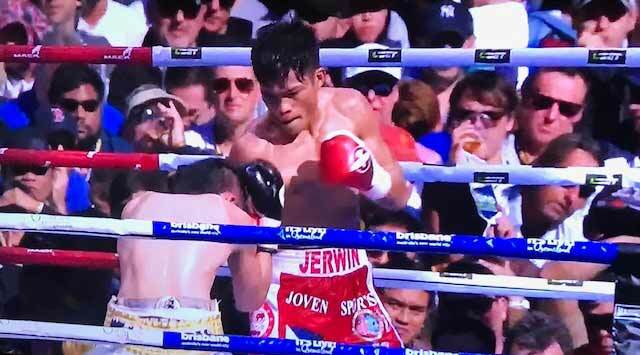 Home Boxing Ancajas Shines in "Battle of Brisbane"
Ancajas Shines in "Battle of Brisbane"
Filipino IBF super flyweight champion Jerwin Ancajas defeated the Japanese boxer Teiru Kinoshita in their fight in the "Battle of Brisbane". Ancajas who showed a big heart knocking out the Japanese in the 7th round in over 50,000 audiences at Suncorp Stadium, Brisbane, Queensland, Australia is now heading to his stardom. The 25 years old from Cavite City is luckily included in the undercard of Pacquiao vs Horn Fight. For sure, this big win of Ancajas will surely put him into something huge and it's also stepping stone for more bigger fights. There's a lot of big fights await for Ancajas. We have Roman Gonzalez, Naoya Inoue, Wisaksil Wangek, Khalid Yafai, and Juan Francisco Estrada in this division and those fighters are surely eyed on Ancajas IBF belt. It will be absolutely a difficult task for Ancajas but it will also a great opportunity for him to prove that he is one of the elite fighters in the super flyweight division.